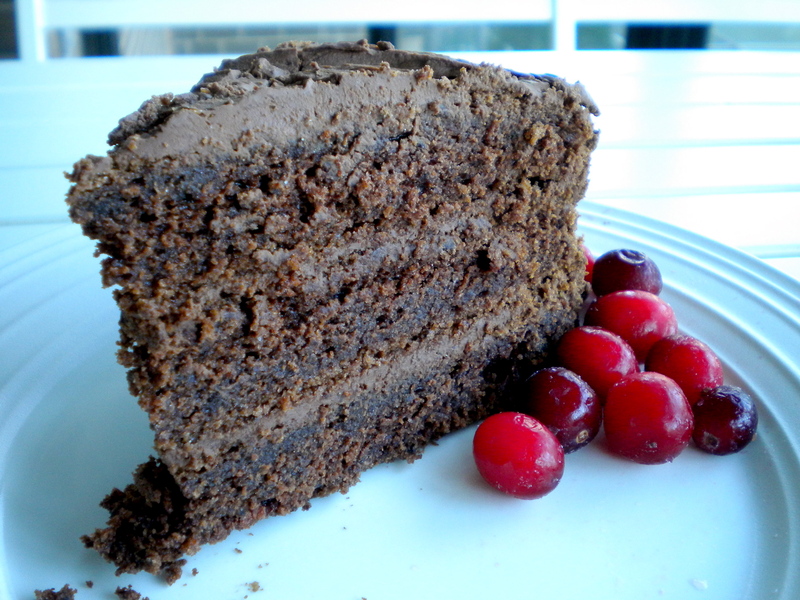 Chocolate Layer Cake – Voila! Hold on to your hats ladies and gentleman — this cake is rich! If there could be a theme song to play while eating it, it would have to be “Puttin’ on the Ritz.” This music video is pretty strange and has no bearing on how good this cake is. The cake uses 99% and 70% cacao so already you know you’re in for something good. Preheat the oven to 350 degrees. Lightly grease the bottoms and sides of three 9-inch round pans. Line the bottoms with parchment paper. 1. Melt the chocolate in the top of a double boiler or in a bowl placed over hot, but not boiling, water. Let the chocolate cool for 10 to 15 minutes. 2. Mix together the flour, baking soda and salt. Then sift the combination into a small bowl. 3. In a larger bowl, beat the butter with an electric mixer until it is light and fluffy. Add the brown sugar and continue beating until creamed. Gradually, 2 tablespoons at a time, add 1 cup of the granulated sugar. This should take about 6 minutes. The mixture will be very light in both color and texture. Scrape down the sides of the bowl as you beat. Beat in the vanilla extract. 4. Break 2 eggs into another small bowl. Add 2 additional egg yolks (whites will be beaten separately). Whisk until frothy and add to the butter/sugar mixture. Add the sour cream, then the cooled chocolate to butter/sugar mixture. 5. At low speed, alternatively add the milk and the flour mixture in several additions. Do not overbeat. 6. Beat the egg whites until frothy. Increase the speed and gradually add the remaining ¼ cup sugar, one teaspoon at a time. Continue beating until the whites are stiff and shiny. Fold the beaten egg whites into the batter. Be sure there are no white lumps. 7. Divide the batter into three portions when pouring into the prepared pans. 8. Bake for 15 minutes. Then move the pans around in the oven so they all bake evenly. Bake for an additional 10 minutes or until the centers bounce back when lightly touched and the cakes begin to pull away from the sides of the pan. NOTE: If you’re making this one day ahead, when the cakes are completely cooled wrap them in saran and store at room temperature. Make frosting the day/moment you’re ready to frost. 1. Melt the chocolate in the top of a double boiler or in a bowl over simmering but not boiling water. 2. Put the evaporated milk, butter and 2 tablespoons of lqueur in the bowl of a food processor. Add the chocolate and process until the frosting is thick and creamy. Use immediately to frost the cake. If the frosting is not thick enough to frost the cake immediately, refrigerate it for half an hour or let stand at room temperature for one hour until it is sufficiently thick. Then frost the cake. 1. Unmold the cake layers from their pans. Peel off the parchment paper. Place first layer on serving platter. Sprinkle generously with Tia Maria. Spread a layer of the frosting. Place the second layer on top. Continue each step until all layers are used. Frost the top and sides of the cake. This looks so yummy, Emily, that you’re making it very hard for me to stick to my vow to make only salads this week! (I’m still recovering from Thanksgiving.) I’ll defiintely sock it away as an idea for a special occasion during a non-salad week. Thanks………. Thanks Tinky! You should make the cake for one of the upcoming holiday parties you may be going to — I’m pretty sure it’ll be a hit! Anyway, thank you for posting this recipe! Pingback: Cherry Pie and Thanksgiving « Voila!